Find the error! Did you think it would be this easy? 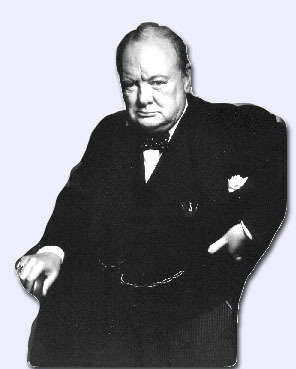 Winston Churchill was asked to give a commencement address at the Harrow School, his alma mater. (Various sources say it was Cambridge or Oxford, and some even say Harvard, which is just silly); The ceremonies were well attended - Winston Churchill was speaking! He stood at the podium, addressing the graduates. "Never give up," he said, and returned to his seat. He got up again. "Never give up," he said, and returned to his seat. He got up a third time, and stood at the podium. "NEVER GIVE UP!" he proclaimed loudly, and his speech was over. Now press the "back" button on your browser, get out a sheet of paper and perhaps a graphing device, and find the error.